We run a mixed 600 acre farming operation of Citrus and vines just North of Griffith NSW. Our agricultural venture has endured three generations of rewarding and successful farming. However in recent times we endured the tests of nature, with extreme temperatures/evapotranspiration rates, well below average rainfalls and reduced water allocations. In light of all this and with our aim to increase our cropping and profitability we knew we needed to find a more economical and sustainable edge for our farming business. It was when we were introduced to Jim Oshana from the Omni Environmental Group earlier this year; we knew that his company had the irrigation technology that would benefit us immensely. His magnetic irrigation solutions were supported by more than thirty years of research and development with studies and accreditations that were recognized worldwide. Not only was this technology backed up by science but also by a 12 month money back guarantee and a 10 year manufactures warranty, so it soon became evident that we had nothing to lose and should give the technology a try. In writing this letter with the utmost honesty, I must admit that at first we were skeptical about magnetizing our irrigation water but within the first few days of installation to our drip irrigation system we made some overwhelming discoveries and couldn't seem to wipe the smiles of satisfaction off our faces as we watched the following events unfold before us. What events or discoveries you may ask! Or what is all the hype behind Omni Technology. Let me start by saying that with our drip irrigation Motorola Irrinet Software and our Cimrex Pump Station Control Module we were fortunate enough to be able to monitor pressures, water volumes and Power consumption through tabulated and recorded data since our inception of drip irrigation. As can be clearly seen here, we could never open all our grape valves/blocks all at once and when we tried the system was underpressured (running at 420 Kpa & only 520 m3/hr) and none of the valves/blocks could run at designated pressures thus the occurrence of some CNL drip emitters remaining closed in certain run lengths in certain blocks. After installing the magnetized system and running the irrigation for the first time we immediately seen a 10% improvement in main line pressures and volumes. We were over whelmed with the results and went one step further and asked ourselves - if this is a measurement of how magnetized water travels lighter, freely and with less viscosity all because of the way OMNI technology has altered the molecules in the water- what can we expect with power savings now that the pumps are running easier! 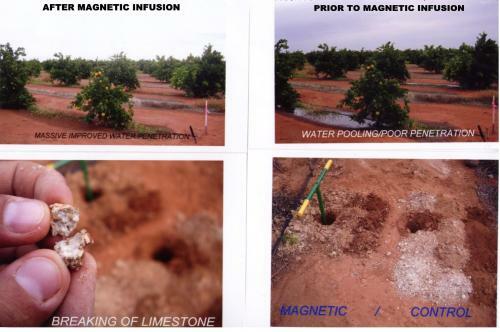 So we measured the draw of current in (Hz) on a moderate to high-powered shift irrigating citrus and the results were blatantly obvious with this shift notoriously running at 50Hz and now after magnetic infusion running at 45Hz! We could not be more pleased with the efficiencies and power savings $$$$, this technology is a big plus for us! In summary what Jim was claiming was proven beyond doubt and we are now assessing water penetration, sodium dissolving capacity in saline soils, the unlocking of nutrients within the soil profile and the breaking down of sub soil limestone. The results on penetration and limestone breakdown are encouraging and although it is only in its early stages we remain with the firm belief that investment in this technology is the best money spent for anyone committed to a sustainable farming future! We will continue to keep OMNI updated with further research as the next growing season unfolds and strongly recommend Omni to any company or individual and thanks again Jim and Tony for giving us the edge for our farming business!